Our stylish, hand-painted wooden boxes come filled with everything a baby boy needs including a cute coordinated outfit for bringing him home from hospital! All items are of the highest quality and Made in USA. 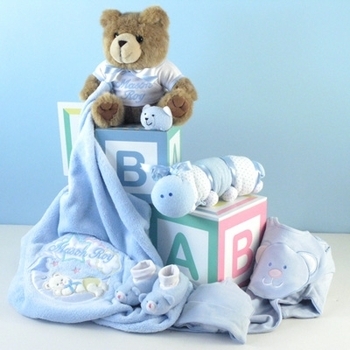 The optional personalization will include the baby's name professionally embroidered on the blanket and the teddy bear's T-shirt for a really unique touch! Delivered beautifully gift wrapped, this is the perfect baby shower gift to give the new parents with all the things they will need to bring their new son home from the hospital. Processing Time Non-Personalized: 1-2 business days.